Busy Bees Patchwork: How did I get here? So now it is my turn. Beccy has urged me to tell you all how my journey brought me to Busy Bees Patchwork. I have sewn all my life, my earliest memories of sewing, are as a small child sewing together all the scraps from my Mum’s dressmaking, patch working already. I lived in America for 11 years and as I needed to make friends, I took quilting lessons and very quickly became hooked and worked my way through all the different aspects of quilt making, meeting some inspirational teachers and making a lot of like minded friends, eventually I began to teach. Teaching beginners brings the most satisfaction for me, there is nothing more satisfying than watching the journey from the first tentative steps to the finished piece of work and knowing you were a part of that process. I have also submitted articles for publication during my patchwork journey and that has been such fun but also quite an eye opener when working to deadlines. Then in 2012 I opened my own quilt shop at Taurus Crafts in Lydney, Gloucestershire, a dream come true for me, Sandra came into the shop one day and as we were chatting and I told her I was looking to move my shop, possibly to Cardiff. In March 2014, I had a phone call out of the blue from her, asking if I was interested in joining them at Busy Bees Patchwork, I nearly fell off my chair and it took a while for it to sink in. I must say I feel incredibly honoured to be a part of Busy Bees Patchwork, Sue and Sandra have the most incredible business and the introduction to Beccy has been a fantastic bonus. Quilting still remains my passion, my butterfly mind is always flitting from one idea to the next and patchwork covers such a diverse area, I am never bored with it and all that beautiful fabric to play with. 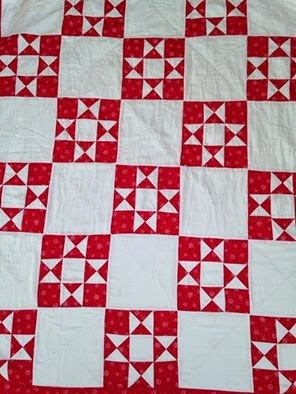 This is my first Christmas quilt, made for my young daughters to snuggle under, over 20 years ago, the Ohio Star was one of the first quilt blocks I learnt to piece, it is still one of my favourite star blocks, although very simple, this well worn quilt holds precious memories for me. I am excited for the future and hope you too will continue the journey with us all, here at Busy Bees Patchwork.